Yummo Mummo | Which stripes for which type (body)? My last post was all about Spring Summer 17 (SS17) trends and I covered that stripes of all types were trending this upcoming season, so I wanted to expand on that and help you feel empowered in your wardrobe. And how do I do that? Well, my lovelies, I’m going to take you through what stripes are the most flattering for your body type. As always, wear whatever the heck you want, it’s your body and your life. But, just in case you want a little guidance, here goes……. An Apple shape is defined by a fuller bust, a fuller middle section, and narrow hips and legs. You really want to play up those legs and ankles. An apple a day, and all that jazz (type of apple, get it!) Read below for the intel on why these stripes work for this body type. + the V neck is going to help elongate the neckline. + the wrap waist definition is helping to define a waist (a little someth’n-someth’n apples need help with). + the vertical stripes help create length, making you appear taller and stretched out. + the wedges play up those fabulous pins and ankles (thus detracting the eye away form the middle). + the wider sleeves help balance out the top/middle/bottom. I had some fun with the accessories, mixing these incredibly beautiful jeweled statement earrings with a red animal print cluch. I love pops of color against stripes. Balance out the earrings with a stack of gold bangles and leave that fabulous neckline open. A rectangular shape is defined as less curves, smaller bust and no defined waist, pretty much straight up and down, aka an athletic body type. The trick with wardrobe is to create curves. I always find it funny that rectangulars want curves, and curves want rectangular’s features. Just like straight hair wants curly hair, and vice versa. Go figure. + lets start with those fabulous colored pants, this shape can absolutely play with printed and colored pants (lucky you) + what works about this off the shoulder top is the drape as it helps create volume/curves, as well as the off the shoulder being a fun season trend. + i love navy with red. 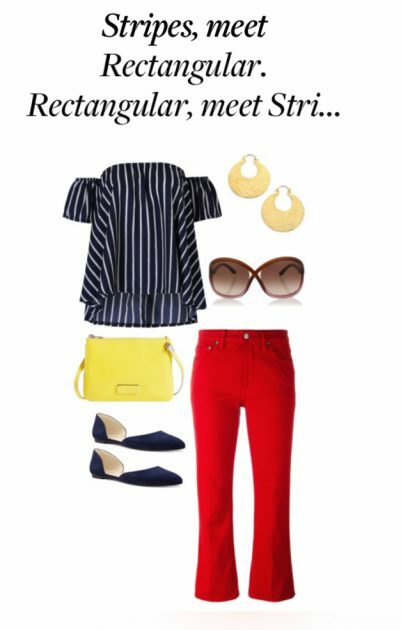 + by adding a yellow bag we are using the color wheel to complement colors in a triad formation (red, yellow, blue) + big large sunnies add a very Jackie O look + simple statement hoops to keep it all about the outfit’s colors and patterns, and to balance out interest. A pear shape is described as a bigger bottom half compared to a smaller top half. Pears are delicious, and green is Pantone’s color of SS17, didn’t ya know!? My fabulous fashion blogger friend Ask Suzanne Bell wrote a blog post on Pantone’s Greenery for SS17. You’ll notice I had some fun making this set. Especially the pattern mixing you see here. + stripes are universal in pattern mxing and go with pretty much any other pattern, as well as mixing blue and yellow backgrounds as they are opposing on the color wheel. + the length of the skirt will stretchout the bottom half helping it appear leaner + diagonal stripes are incredibly slimming, designers put them on jacket and blazer pockets on a slight angle simply because of this effect + the ruffled top (all tops) are helping to create volume on the top half, thus balancing out with the bottom half + to keep things casual, I’ve added this sweet heart necklace to play that open neckline + gold sandals for that summer vibe and gold tones. An inverted triangle is defined as larger top half to a smaller bottom half. Fabulous gams, broader shoulders and bust, you get the picture. We want to create balance. + the wider stripes on this fitted skirt is going to widen the hips + the V neck will elongate the neckline + the denim jacket, worn unbuttoned, will create a column, thus creating the eye to go up and down (not side to side) + the chevron necklace angles the eye down and the wooden accent ties in with the raffia wedge + the yellow wedge pulls in the yellow accents of the skirt as well as playing up those fabulous legs. *Let me interject here with a tip on stripe width for different body types. 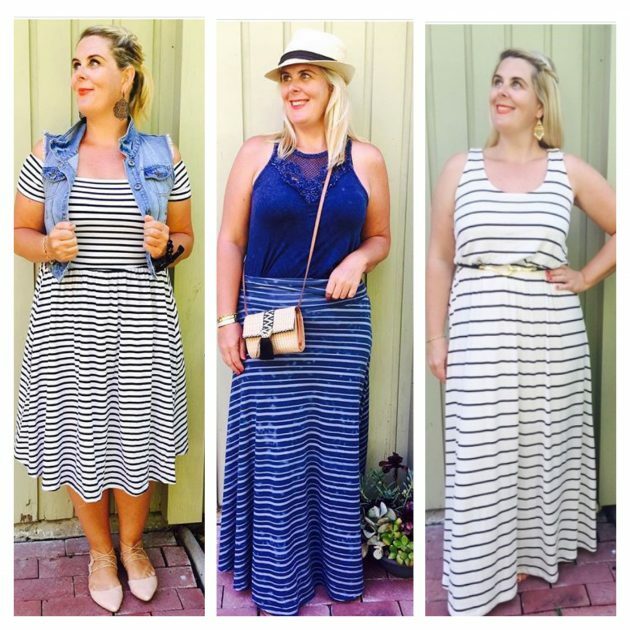 Curves work best with a thinner stripe. Less curves work well with a thicker stripe such as a rugby stripe. It’s all about balance and creating/not creating volume. Defined by a proportiante top half to bottom half, defined waist, and curves. Although I have used myself as this example, I am not all hourglass – I’d say 70% hourglass and 30% pear. 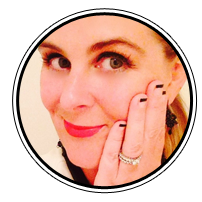 A tonne of women are mixed body types, believe me as I’ve measured hundreds of them myself! Additionally, in my 20’s, I was a pear and became much more hourglass closer to 40 and after 3 kids. 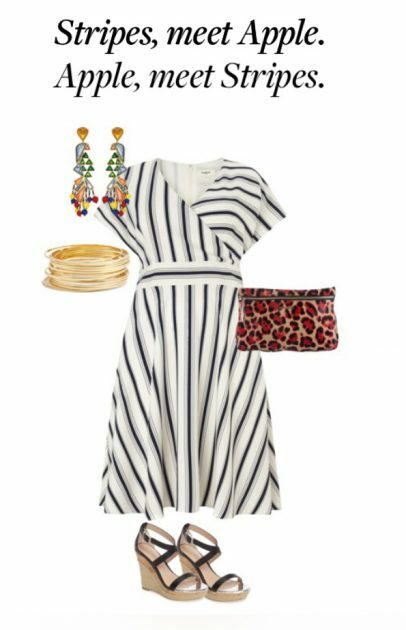 + all these outfits have waist definition, my best bet is to play with what I have including showing off my hourglass waist + the thinner stripes work best on me, any thicker and it creates volume + I’ve added accessories to add interest and balance -bracelets, hats, cross bodies and earrings, oh my!